31/8/2018 The ACV/GARDS girls traveled to Frankston TAFE Chisholm and delivered 2nd asbestos awareness session to a great bunch of apprentice plumbers. 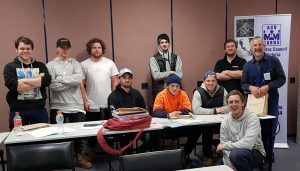 The ACV/GARDS girls will be back again for the next 6 weeks talking to a whole lot more apprentice plumbers – great questions and conversation. It was a privilege and honour to talk to the apprentices and understand their work places and issues that they come up against. Thanks to Fred their trade teacher for a really good session.